I write this with two babies, their bellies full of milk, snuggling on my chest. 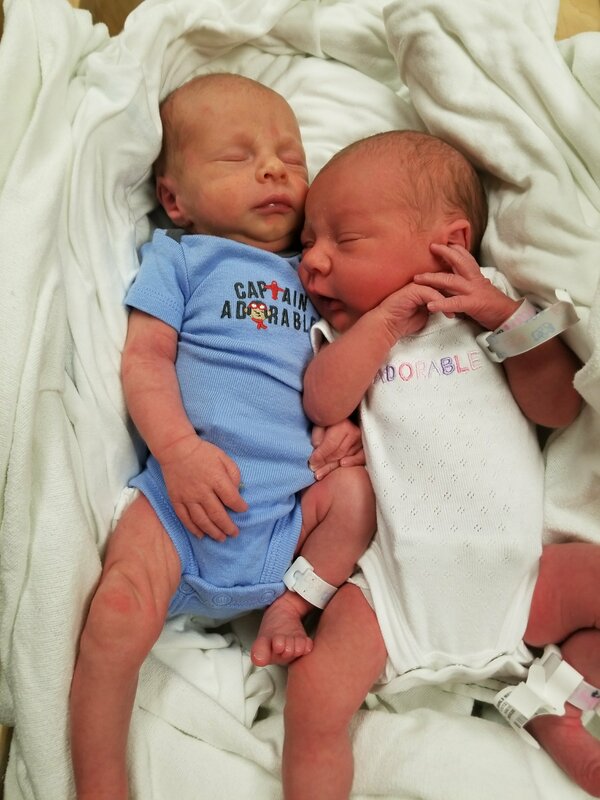 They arrived 2 weeks ago today, and it’s been a bit of a whirlwind since. I’ve been trying to find the words to succinctly and accurately describe their arrival while fearing inadequacy to express the perfection of the experience. Thanks to supportive co-workers, and a lot of determination, I was able to work until the day before my induction. 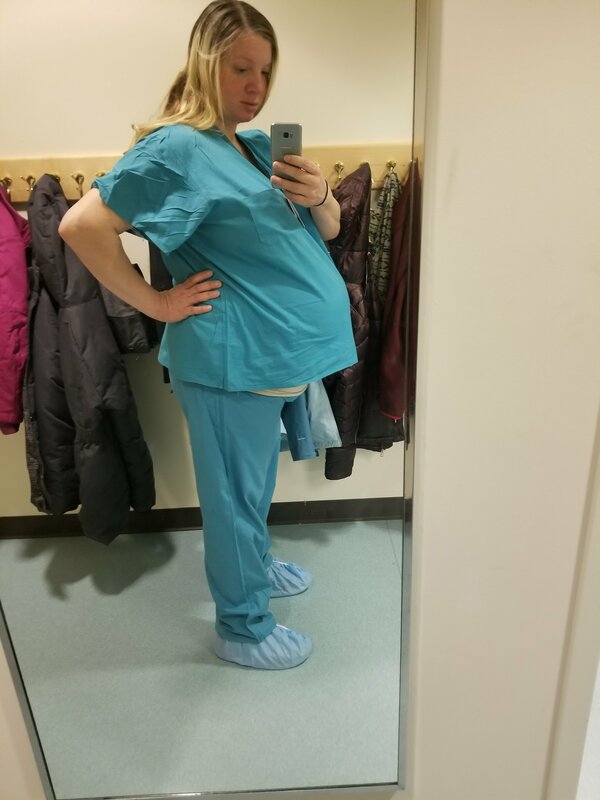 I went in at 36 weeks pregnant for a scheduled induction. My doctor and I had everything planned: she would rupture baby A’s sac. If labor didn’t kick in after a couple of hours I’d be started on pitocin. Baby A (the first baby to come out) was head down, and baby B was breech. The plan was to reach in and grab baby B by the legs immediately after A delivered. I didn’t want an epidural either. As I previously required a cesarean section with my last set of twins, this delivery was a VBAC (vaginal birth after c-section). My husband and I received a royal welcome by my amazing co-workers who surprised us with room decor and gifts. Fortunately everything actually went according to plan. 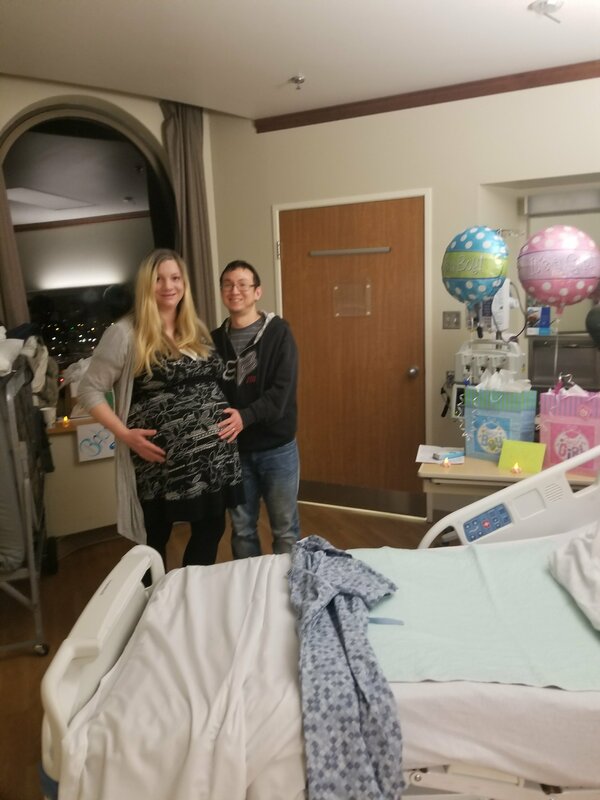 I did scream for an epidural after discovering that hours of painful pitocin contractions only changed my cervix from 4cm and 80% effaced to 4cm and 90% effaced. But in the 10-15 minutes it took for the anesthesiologist to arrive and start putting in the epidural, I dilated from 4 to complete and was ready to push. There was barely enough time for me to lay on my back as baby A came out with the next contraction. My wonderful doctor didn’t even have time to don gloves to catch him. Two minutes later baby B was born feet first, and shortly after the placenta delivered. Not all of the placenta came out, however, so it was necessary for my doctor to reach inside my uterus to retrieve it. I felt everything. Obscenities were shouted and I didn’t hold as still as I should have. Did I mention that I work in L&D and consider the team providing my babies and I with care to be my friends and family? I have the urge to apologize even though I logically know that it’s not necessary. I’ll have to purchase blank cards because Hallmark doesn’t make one for the occasion of “I’m sorry for what I said when your hand was in my uterus”. The reason for my induction at 36 weeks was suspected IUGR (intrauterine growth restriction). Both babies had been measuring small throughout my pregnancy. At the last ultrasound baby A was estimated to be a shrimpy 3lb 12oz with a head larger than his body. Thankfully these measurements were incorrect. Although they were still small enough to be considered IUGR, he wasn’t as alarmingly tiny as expected. Without further adieu I’d like to introduce my small but mighty bundles of perfection. Phoenix Ray, 4lb 9oz. Lana Louise, 4lb 14oz. Both 17 inches long. Dare I say that so far they’ve been my easiest set of twins? They are excellent breastfeeders and are generally happy. For 36 week late preterm babies they sleep rather well. Instead of feeling overwhelmed as I expected, their presence has brought me unimaginable joy. I am cherishing every moment with these sweet new humans. 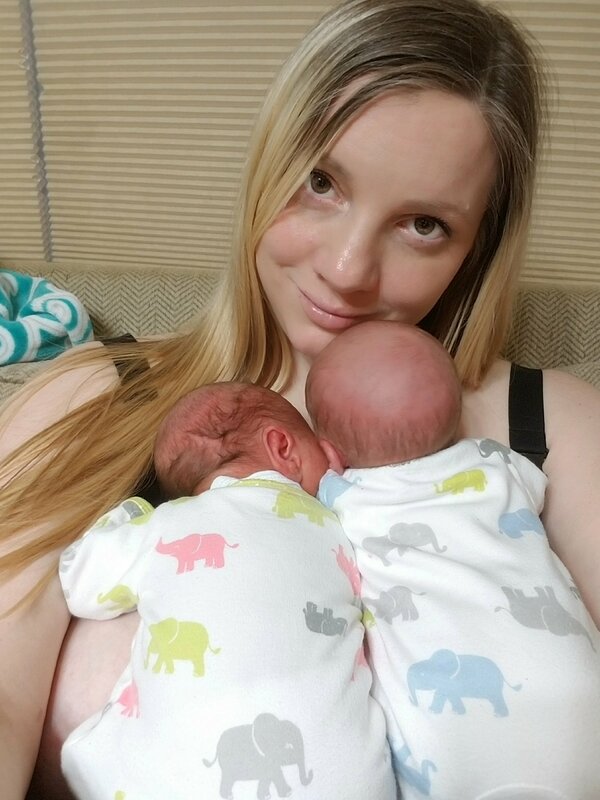 Subjects of posts coming soon: Family photographs, newborn photographs, SB sox winner, breastfeeding twins, babywearing twins, milk donation, circumcision, and anything requested by readers. Previous Post Cankles be gone! Next Post Newborn photos are in! Great job momma! I cannot even fathom having a hand up my uterus to pull out the rest of my placenta, right after birth😭. You need a cape for this birth, and every other, I presume.